This raw, unprocessed image was taken by NASA's Cassini spacecraft on May 20, 2012. The camera was pointing toward the Saturn moon Tethys at approximately 81,580 miles (131,290 kilometers) away. Although Saturn's moon Tethys appears bland and neutral from space, it contains a number of features of interest. A large impact basin and an enormous trench are just two of the intriguing landmarks that mar the surface of the icy moon. A heat map of the satellite also reveals a configuration that resembles the title character in the video game Pac-Man. One of the great mysteries of Tethys is where large arcs of red material came from. The arcs were first detected in 2004, but really became prominent in 2015 images of the moon from the Cassini spacecraft taken in better lighting conditions, during summertime in that region. Because they lie across other features of Tethys, they are relatively young. Tethys was one of a pair of moons orbiting Saturn that was discovered by Giovanni Cassini in 1684. The Italian astronomer spotted both Tethys and Dione on March 21, making them the last two of the four moons first found by the astronomer (the other two were Iapetus and Rhea). Cassini's discoveries were the first found in orbit around the ringed planet. Cassini called his moons the Sidera Lodoicea — the Stars of Louis — after King Louis XIV. For almost 200 years, the moons of Saturn were referred to numerically, based on their distance from the planet. Tethys, which orbits 183,100 miles (294,660 kilometers) out, was termed Saturn III, since it is the third most distant of the major satellites. In 1847, British astronomer John Herschel suggested that the moons surrounding the ringed planet should take their names from the Titans, the mythological siblings of the Greek god Cronus (Saturn to the Romans). In Greek mythology, Tethys was the daughter of Uranus and Gaea, and the wife of Oceanus. A watery goddess, she was considered mother of the chief rivers, and birthed 3,000 daughters known as the Oceanids. During the war between the Titans and the Olympians, Tethys raised Hera, wife of Zeus. Features on Tethys are taken from Homer's poem "The Odyssey." Although Herschel didn't realize it at the time, a watery goddess made an ideal name for the moon. Like many of the satellites around Saturn, Tethys is made up almost entirely of water-ice. At average temperatures of minus 187 degrees C (minus 305 degrees F), the ice on the lunar surface responds much like rock. 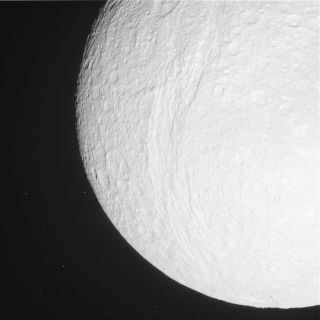 The photo of Saturn's moon Tethys was taken on April 14, 2012 and received on Earth April 15, 2012. The camera was pointing toward Tethys at approximately 185 kilometers away, and the image was taken using the CL1 and CL2 filters. This image has not been validated or calibrated. The frigid surface is highly reflective, a characteristic only increased by the bombardment of water-ice particles from the plumes of its sister moon Enceladus. The floor of many of the numerous craters on the satellite shine brightly, further suggesting the presence of water-ice. As the third closest of the major moons, Tethys feels a strong pull from Saturn that could have kept it partially molten longer than it would have suffered at a more distant orbit. As a result, it lacks the heavy cratering of Rhea or Dione, which suggests that it was resurfaced in the recent past. Tethys has no atmosphere, and keeps one face perpetually pointed toward its parent planet. It travels around Saturn once every 1.888 Earth days. Although most of signs of impact on Tethys are relatively small, a giant one known as the Odysseus Crater covers nearly two-fifths of the moon's 662-mile (1,066 km) diameter. At 250 miles (400 km) across, the crater is about the size of Saturn's smallest major moon, Mimas. An ancient feature, the crater is nearly flat, with its floor conforming to the shape of the moon. The enormous impact should have shattered a stiff, solid body. Tethys obviously remains intact, leading scientists to conclude that the crash occurred early in the moon's history, when Tethys was still partially molten. A large trench runs from the moon's north pole to its south pole, extending 1,200 miles (2,000 km) and spanning nearly three-quarters of the planet's circumference. Known as the Ithaca Chasma, after the country ruled by Odysseus, the trench is 62 miles (100 km) wide and 2 to 3 miles (3 to 5 km) deep. The chasm could have been created by the same impact that formed the Odysseus crater, which lies on the other side of the moon. Another possible explanation is that the surface froze before the interior, leading to an expansion that cracked the crust. This view of the Pac-Man shapes on Saturn's moons Mimas and Tethys show variations in the heat signature of both moons as seen by an infrared-detecting tool on NASA's Cassini spacecraft. While taking thermal data, NASA's Cassini spacecraft revealed a Pac-Man-like shape on the icy satellite. The video game character configuration may have been created by the varying surfaces on the moon. Scientists think that electrons bombarding the leading face of the satellite could have turned the region into hard-packed ice that changes temperature more slowly than the rest of the moon. Tethys' Pac-Man heat map was the second to be found in the solar system, only two years after Cassini noticed a similar configuration on Mimas. Other observations of Tethys suggest that its crust is similar to Dione and Rhea, two other icy moons of Saturn. A 2016 study in the journal Icarusnoted that Ithaca Chasma was not caused by the small body that created the crater Odysseus, contrary to what was believed in the past. However, the "Odysseus impact event" could have created some bands of large ice particles seen stretching across the north and south. Separately, a 2016 presentation at the American Astronomical Societysuggested some craters on Tethys (and other moons) could have been from leftover debris from a previous generation of moons.